I guess the latest issue of Teen Titans is the perfect place for the phrase ‘rearranging the deck chairs on the Titanic’. We already know that with Rebirth, this current team of Titans is going to come to an end. Either the team will split up, or they will never have been a team at all. Normally, this would be the perfect opportunity for a big, climactic something or other. But writer Greg Pak only came on to the series a few issues ago, and he’s kind of just going through the motions. In any other situation, this would be a mighty fine issue of Teen Titans. But that omnipresent feeling of just killing time is unavoidable. So we kinda sorta do get that team up between Wonder Woman and the Teen Titans. And we do get to see Wonder Girl learn about her previously unknown past. And there are some nice character moments found within Teen Titans #19. It’s a finely written and drawn comic. I don’t think I have any particular complaints, which is very different from my previous Teen Titans reviews, I know. It’s almost as if Pak is just keeping the boat above water. Tell some innocent, innocuous stories that don’t really matter in the long run, but keep the book coming out on time. 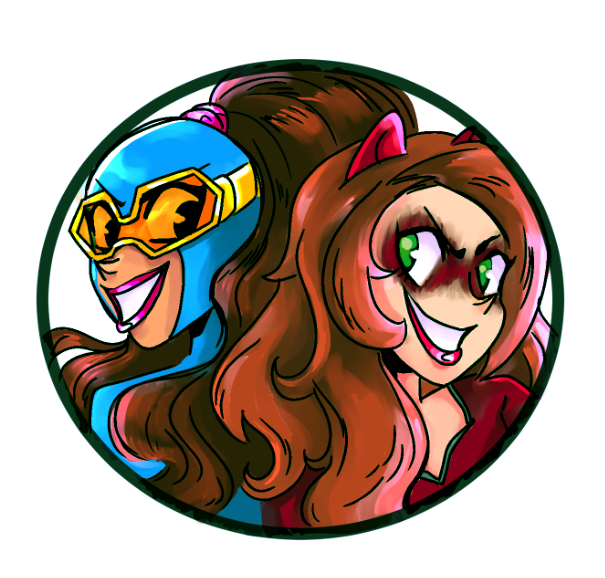 I suppose I don’t have a problem with that, because we live in a world where Unbeatable Squirrel Girl and Ms. Marvel exist. Join me after the jump for the full synopsis and more review! The issue opens with Cassie Sandsmark digesting the news that she is Wonder Woman’s niece and how that’s kind of awesome. The Rod of Asclepius has fallen into a deep crevice, and Cassandra says she wants to use the powers of the Teen Titans to go down and get it. But Wonder Woman says there is always a price to be paid when you steal the powers of a god, so they shouldn’t go through with using the Rod to resurrect Cassie’s father. Wonder Woman says she’ll go down and get the Rod, then they’ll give it back to Apollo. Cassandra disagrees and urges Cassie to take risks. Cassandra dives down into the crevice to fight Wonder Woman. The little battle causes the Rod to fall even farther down, so Cassie and the Titans jump in to grab it. Red Robin swoops down and makes the grab after a few fumbles. Now that they have the Rod, this opens the Titans up to a debate on whether or not they should use it. Raven and Bunker side with Wonder Woman, claiming that magic and gods are not to be trifled with. 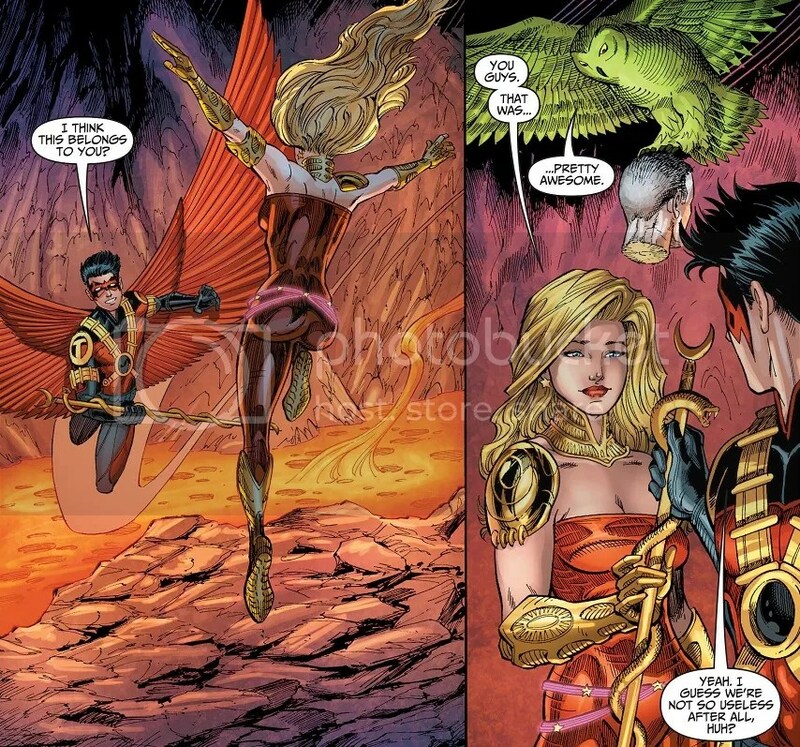 Red Robin and Power Girl side with Cassandra in resurrecting Lennox. Red Robin points out that resurrection isn’t unheard of, especially considering his bat-family. Cassie tells everybody to slow their roll, because it’s her decision, and she’s still thinking. On the one hand, her only real memory of her father is his promise to come back someday to explain everything to her. On the other hand, maybe the Titans are family enough. …who immediately betrays the team and uses the Rod’s healing power to restore her throat and her mind control powers. She then orders everyone to freeze in place. The once again crazy Cassandra explains that before Lennox tore out her throat and disabled her powers, she gave herself a command to do and believe whatever it took to get her powers back. That’s how she was able to fool the Lasso of Truth in the last issue. While she’s monologuing, Bunker uses his powers to fill everyone’s ears with bricks. That way, when Cassandra orders them all to ‘die’, none of them hear it and are able to break free of her control. 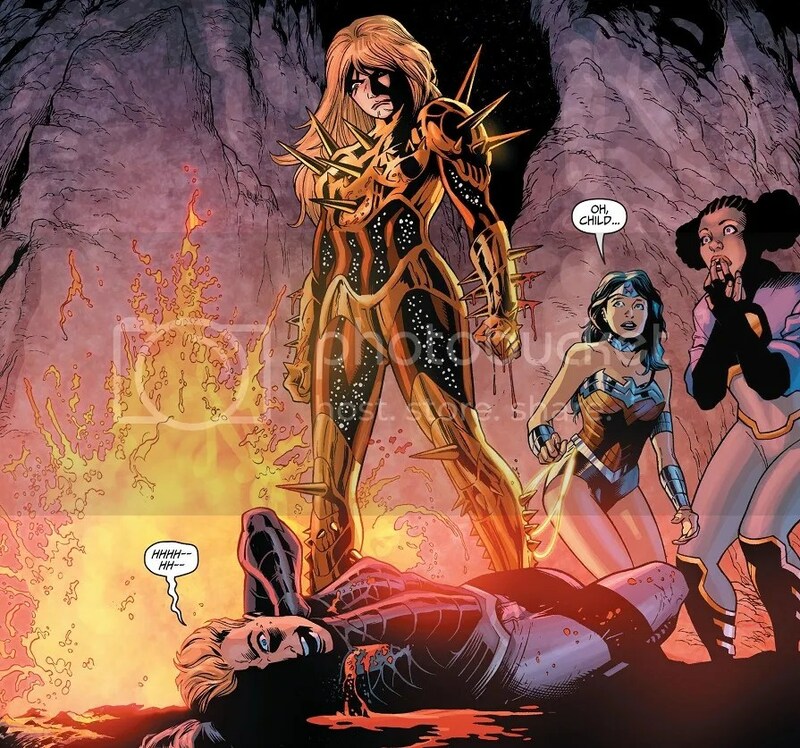 Wonder Girl then proceeds to armor up and tear Cassandra’s throat out all over again! 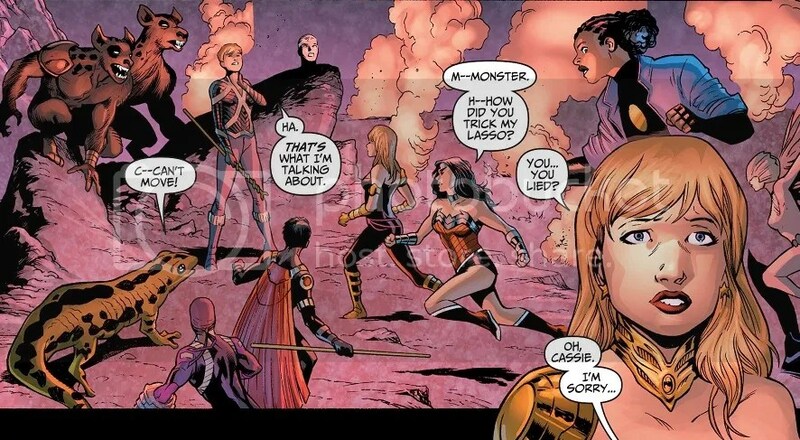 Wonder Girl then uses the Rod’s last bit of energy to heal Cassandra’s throat, but not her voice. She’s alive, but depowered. Wonder Woman takes Cassandra into custody, intent on delivering her to Mount Olympus to face the judgement of the gods. She offers to take Wonder Girl with her, to introduce her to her past. 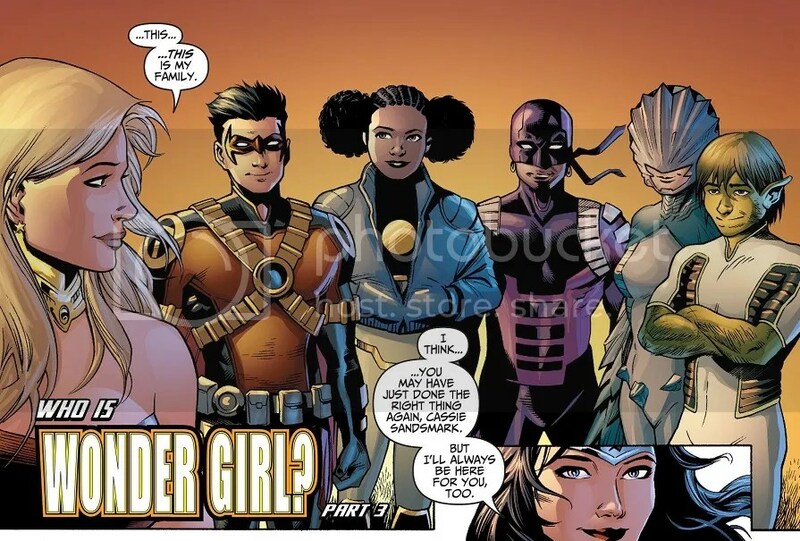 But Wonder Girl says that the Teen Titans are all she needs. Considering Wonder Girl is not a member of the Teen Titans in Rebirth, why not just send her with Wonder Woman? Why not send her on an epic quest in the world of Greek myths? Why not resurrect Lennox? Why not do anything interesting or different? Because Greg Pak and Teen Titans are only treading water. 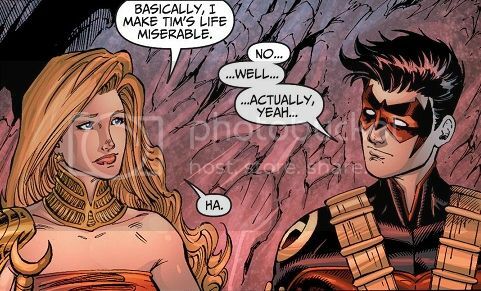 Teen Titans #19 is a fine comic. It’s harmless. The team members are all there, they all get dialogue, there’s a little bit of character development, and no real perplexing or ludicrous developments. Cassie learns some neat stuff about her past, but it’s stuff that we, the reader, already knew. The team doesn’t really get to team up with Wonder Woman. They’re just kind of all there together. And then Pak goes and chooses the more boring option every time. Take a risk and resurrect Cassie’s dead father so that she can actually spend some time with him? Nah. Develop Cassandra’s character so that she’s not just a crazed villain? Nah. Take Wonder Woman up on her offer to go exploring the world of Greek myths and finally answer those nagging questions about your mysterious past? Nah. Even with Rebirth coming along to wipe all of this away, Pak still chooses the boring path. Teen Titans isn’t meeting its end with a bang or a whimper, but a casual shrug. 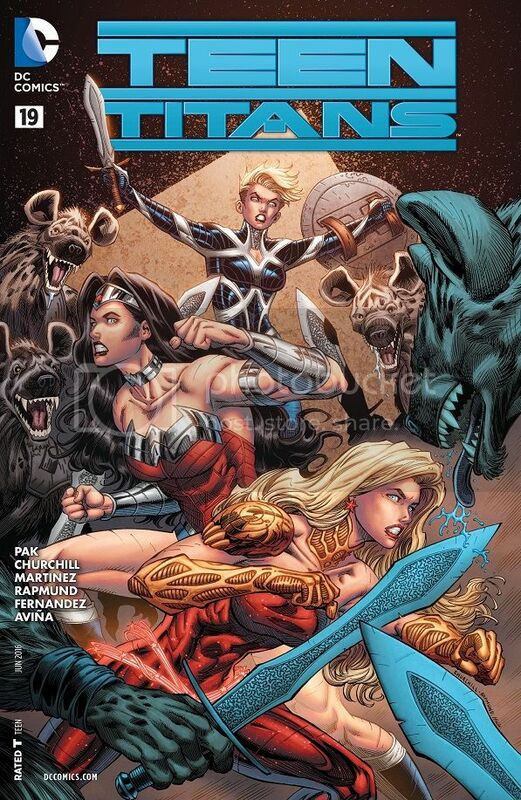 Posted on April 28, 2016, in Comics, DC, Reviews and tagged Teen Titans, Wonder Girl, Wonder Woman. Bookmark the permalink. Leave a comment.